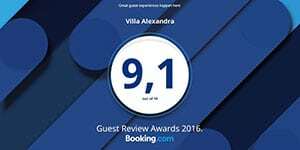 Villa Alexandra is the perfect destination for families with children. The large fenced garden is suitable and perfectly safe for your children. Let your children free to play on the playground and enjoy the sea which is located directly in front of the garden. We can also offer baby cots in the apartments and make you feel at home during your stay with us. Enjoy the crystal clear water of Halkidiki and the deep blue sea, which is located right in front of our apartments. The beach of Polichrono is awarded each year with a blue flag, the symbol of quality and cleanliness. In our garden you can find kiosks and various outdoor seatings, sun beds and umbrellas to enjoy a coffee or a meal, the sun and your holidays as carefree as possible. In the village and the surrounding area, Hanioti (4km), Pefkochori (8km), Kriopigi (5km), Kallithea (8km), you can find several restaurants, shops, cafes and bars and generally a lively night-life to suit all tastes. Also, the summer period (Jul-Aug) hosts the organization of important and interesting events by both local and private entities, such as the Kassandra Festival, the Festival of Sea, Sani and Athitos, as well as local festivals, like the sardine festival.